Every dog needs their own space to feel secure and comfortable. Throughout their lives, crates will become a place of protection. Crates are a versatile piece of gear that can be used for transportation, as a training tool, and as a cozy sleeping spot. Because of this, it's important that you invest in a high-quality crate that can last for many years to come. While finding that perfect crate for smaller dogs is a cinch, it can be a daunting task for large dogs. Larger breeds require more space. They should have enough room to lay down, turn around, and not feel constricted. Placing a large dog in a crate that's too small will make them feel claustrophobic and anxious. It's imperative that you take the time to find an option that suits your dog's needs. To help you on your search, here are some of the best dog crates for larger dogs. This crate is a solid option made from durable metal wire. The corners are rounded for safety and the entire unit is coated in a resilient satin black finish. To keep your pup secure, the crate utilizes a strong slide bolt system. The crate comes with a plastic pan for easy cleanup and a divider to make your pup feel comfortable as they grow. Rubber roller feet are included on the bottom of the crate to ensure that your floors aren't ruined. When not in use, the crate folds up into a compact shape. It also has a carrying handle for easy transport. From Merry is this functional piece of decor. The large crate is made from attractive wood veneer. It's available in two sizes. The largest size measures 40 inches long by 28 inches wide. It's approximately 31 inches high. With its solid top, it can be used as a side table. A swinging gate in located on one side and utilizes a durable metal locking system. There's also a plastic pan included for cleaning up messes. If your dog needs more room to play, the top of the unit can be removed and the sides can be used to create a long boundary gate. 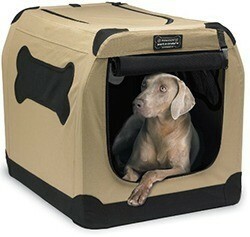 This soft crate from Petnation is designed with travel and comfort in mind. It folds into a small and compressed design. When it's time to assemble the crate, the job can be done in only a matter of minutes. The support system of the crate is made from steel for ultimate durability. The fabric is a tight weave mesh. It holds up well to scratches and regular use. Mesh windows are built right in to promote airflow. It's also water-resistant for quick cleaning. If you want to provide a deep clean, the fabric can be tossed into a washing machine. 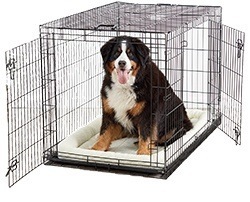 This wire crate from Precision Pet is available in an extra-large size. It measures 48 inches long by 30 inches wide and 33 inches high. It's made from durable heavy-gauge wire that's been coated for protection from rust. A slide-out plastic pan and an adjustable divider are also included. What makes this wire crate unique is the use of two separate doors. The doors provide versatility in placement and use. Both doors use a secure slide bolt lock and safety latches at five different spots. The doors are rounded to prevent injuries. 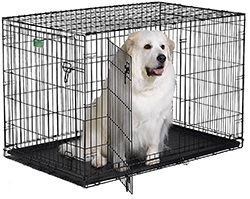 This basic wire dog crate from AmazonBasics is a versatile option that can be used for training and security. It's made from durable metal wire. The doors are rounded for safety. The bottom portion of the crate also features miniature dividers to ensure that paws can't get through. This crate has two doors with secure sliding latches. The crate also includes a removable slide-out pan made from a strong composite material and a divider. The entire unit collapses flat. There's also a handle to make moving the crate a breeze. 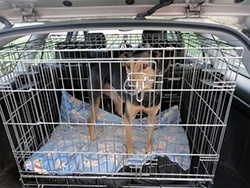 As mentioned earlier, crates are very versatile and will become something that you rely on throughout your dog's life. They can help you keep your dog contained, eventually being your pup's go-to spot for relaxing and comfort. In their earlier years, crates are an essential training tool. Depending on your particular training methods, you may want to use the crate during the housetraining process. Crates are also beneficial for behavioral training and discipline. If your pooch likes to follow you everywhere or get into trouble when you're not around, crates can be a lifesaver. They'll prevent your dog from going where they shouldn't. Whether you use it while you're at work or at night while you sleep, your dog will eventually grow comfortable with the crate and even rely on it to make them feel at-ease. This is beneficial when you're traveling. Crates can be used in the car and on an airplane to ensure that your furry friend gets to their destination safely. Not all dog crates are made the same. On your search, you'll quickly find out that crates come in a variety of designs, materials, and sizes. To ensure that you choose the right option for your dog, you need to consider a number of different factors. The first thing you should be looking at on potential crates is whether or not it will accommodate your dog's size. 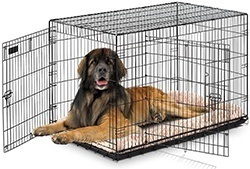 Many dog crate manufacturers provide size and weight ranges with their products for sizing purposes. You should measure your pup prior to searching for a dog crate. It's important that you measure your dog's length laying down and their height as they sit. Your dog isn't going to sit still the entire time they're in the crate. They'll want to change positions periodically to get comfortable. Crates should have enough room to make this possible. At the very least, your dog should have 1-2 inches of head clearance and 4-6 inches of length clearance. When it comes to weight, it's better to go over your dog's weight. This ensures that treats and added extras don't put any strain on the crate. 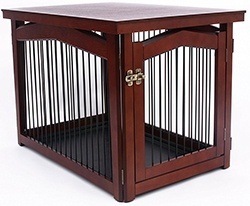 Your dog's general temperament and behavior should be considered when looking for a crate. Different types of crates offer varying degrees of protection and security. If your pooch is a determined dog, you'll need something more solid and chew-proof. The same goes with anxious dogs that will dig, claw, or chew until they're free. On the other hand, a relaxed dog that's comfortable with the sensation of being in a crate won't need something as heavy-duty. 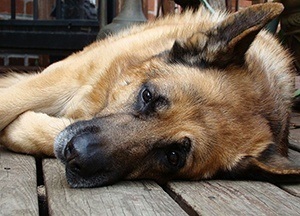 These dogs can benefit from softer options that only provide a bit of privacy and limits. Matching your dog's personality with the crate can prove to be beneficial in the long run. Are you looking for a crate that serves one specific purpose or do you need something that's flexible? This is something you should ask yourself when you're on the hunt. Certain types of crates are better suited for specific tasks. For example, many crates include features that are designed to help you during the training process. Training crates often feature a divider and a pull-out pan for easy cleaning. If you're planning on using the crate for traveling, you may need to invest in a plastic option that's approved by your airline. These crates are easier to move by baggage personnel and have security features to keep your pup safe. If you're traveling by road, you may want to invest in a foldable design. They are compact, easy to transport, and can be set up within minutes. Wire crates are one of the most popular options on the market. Made from thick metal wire, these crates are comfortable, easy to move, and very durable. Most models are very easy to fold up for easy transportation. They have an open design that dogs can easily adjust to. Some can also be changed to accommodate your dog as it grows. Plastic crates are built to withstand a lot of wear and tear. Many models feature a metal wire door and windows. Overall, these crates are more private. The walls are more solid, making the inside darker than traditional wire crates. As a result, they can be more calming and easier to sleep in. If you're traveling by air, plastic crates are a legal requirement to transport your dog. Soft crates are similar in design to camping tents. They feature durable support poles and strong fabric like nylon or canvas. They're a great option for dogs that are already comfortable with being in a crate. They aren't meant to keep dogs confined, but rather provide them with boundaries and a comfortable place to sleep. If looks are important to you, wood crates are the way to go. These crates are often designed to look like a piece of furniture, allowing you to incorporate them into your normal design. Because they're made from wood, these crates are very durable. They're often considered a great beginner's option and can be used for many purposes. Whether you decide to go with a flexible wire crate or a solid wooden option, having a high-quality crate is a must-have for any dog owner. Even if your pup doesn't use it often, a time will come when you'll be thankful you made the investment. By finding the right type of crate for your needs, you can rest assured that your canine companion always has a place to be safe, secure, and calm.